Sunday, February 26th, marks the 84th Academy Awards®, also known as the Oscars. 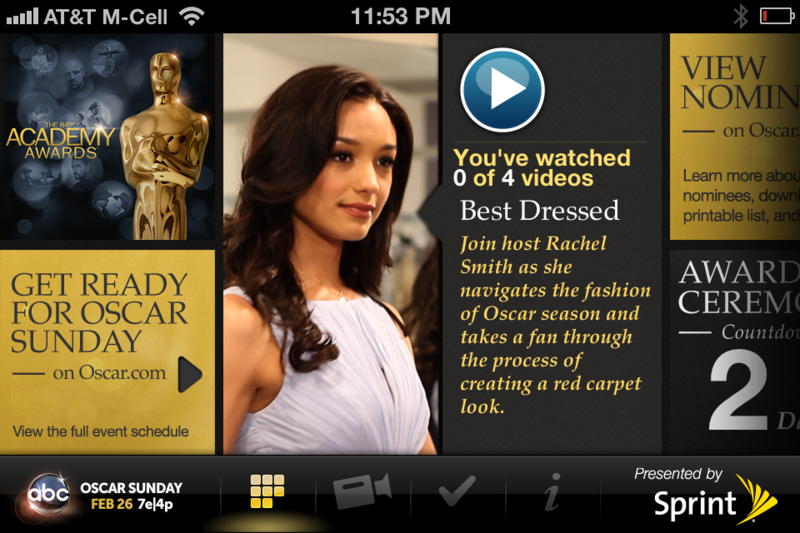 Disney and ABC Television have released an Oscars App to expand the viewers experience of this annual event. Launching the app, I found it was interesting that the app forced a landscape mode. I hadn’t expected the landscape mode for the app, but the graphics looked great. 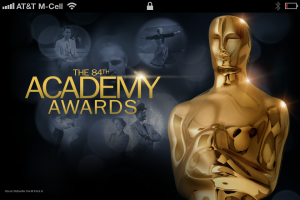 The first menu allows you to slide from side-to-side with different categories to learn about the 2012 Oscars. You’ll find tweets about the Oscar’s, information about the nominee’s, and movie trailers. 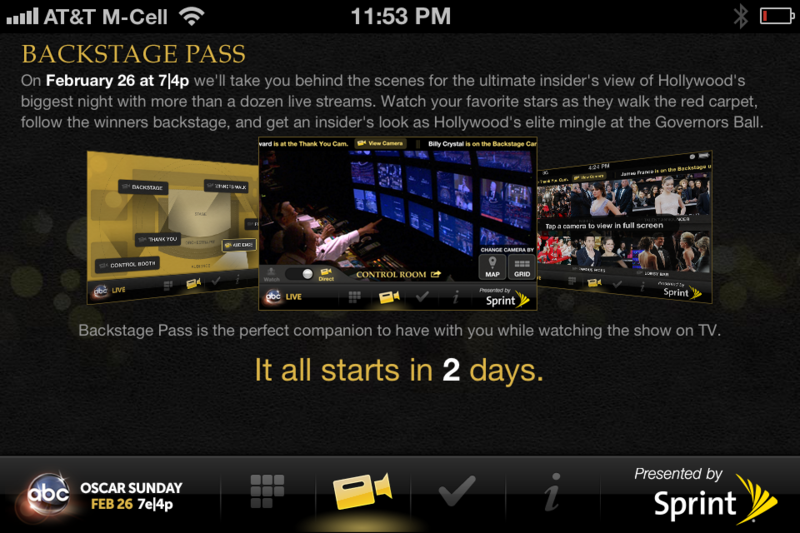 The second menu item is going to allow you a “Backstage Pass” to the Oscars while you are watching it live on your TV. On February 26 at 7|4p we’ll take you behind the scenes for the ultimate insider’s view of Hollywood’s biggest night with more than a dozen live streams. Watch your favorite stars as they walk the red carpet, follow the winners backstage, and get an insider’s look as Hollywood’s elite mingle at the Governors Ball. The third menu item provides the opportunity for you to create your own Academy Award ballot and share it with friends on Facebook. 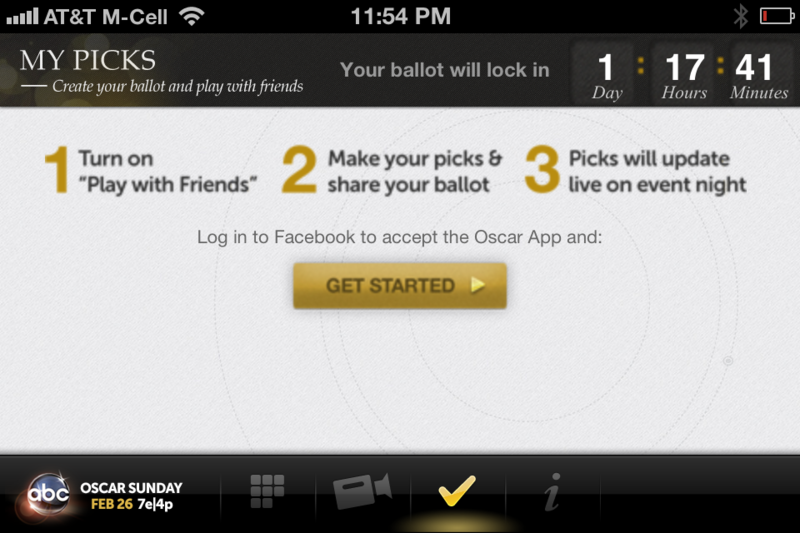 The last menu item is for general information, feedback, and help with the Oscars App. I’m pretty surprised that they have put so much effort into an app that is really intended for a very limited amount of time. I feel as if they made it unique and made sure to have very high quality graphics. Most of the content seems to be loaded remotely, but that is understandable with all of the video content and wanting to make sure it is all fresh. I think they did a great job with the app, and I’m curious to see how the “Backstage Pass” ends up turning out. 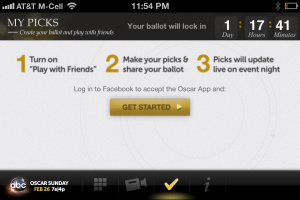 et the ultimate insider’s view of Hollywood’s biggest night with the official Oscars® app. Tune in into ABC on Oscar Sunday, February 26th and use the Backstage Pass feature to get exclusive access to live streams from 24 cameras placed throughout the Red Carpet, Backstage and at the Governors Ball so you can watch more live Oscar action as it’s taking place. Only available in the US. Please be aware that the Oscars app does not stream the TV broadcast. The Oscars® app has more cameras than anywhere else following all the action on the Red Carpet, in the Kodak Theatre and even at the ultra A-list after party, the Governor’s ball. This is the perfect companion app to have when watching the show on TV. Once you download the app, you’ll be a virtual member of The Academy with insider information on all the Oscar buzz, a first person view of the Red Carpet and exclusive backstage access to Hollywood’s biggest night. Use the app In WATCH mode and sit back, grab the popcorn and enjoy our live hosted experience on the Red Carpet and Backstage. For those aspiring directors, switch to DIRECT mode and pick any of our six camera vantage points and zoom in to whatever action you want to see. With Oscars® you get more access, more glamour, more of everything you love! 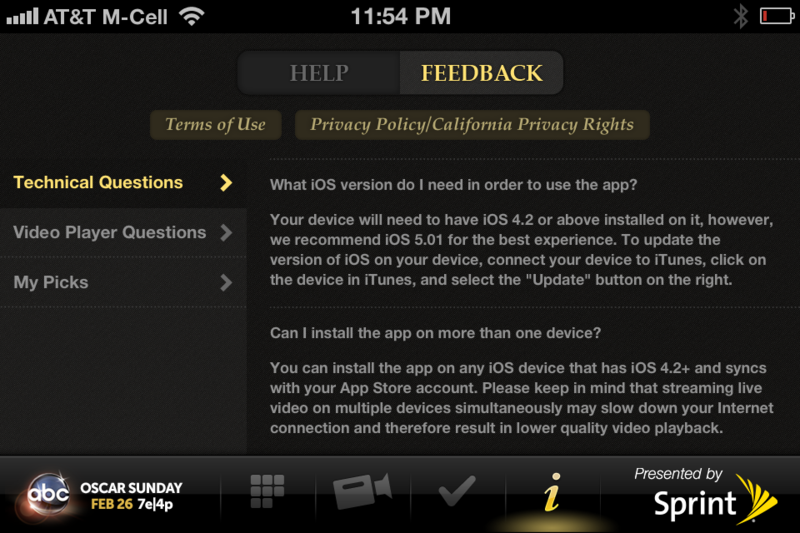 The app is available for iPad, iPhone and iPod touch. The “My Picks” game allows you to predict who you think will win and share your predictions with friends. A Facebook account is required to use My Picks. For complete coverage on The Oscars®, visit www.oscar.com. 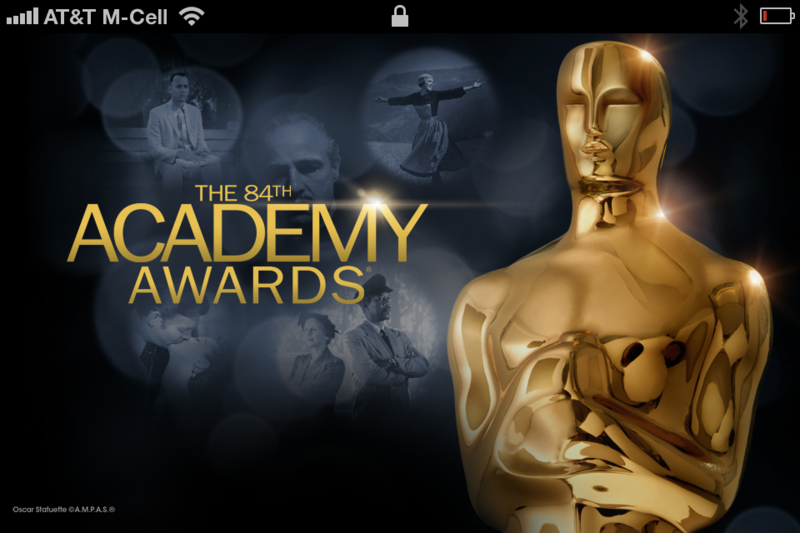 Oscars® requires an Internet connection from a United States or US territory based ISP and iOS 4.2+. You must be located in the United States or its territories to use this app.